Chairman of the Expert Board to the Centre for Army, Conversion and Disarmament Studies in Kyiv, Ukraine, external consultant to the National Security and Defence Committee of the Ukrainian Parliament and Associate Senior Fellow of the Centre for Security and Defence Management. As Vice Minister of Defence of Ukraine in the period 2005-2008, he led the reviews of defence policy, missions, and force development plans and managed major defence transformation programs, including the professionalisation of the Armed Forces, centralizing personnel management, streamlining command and control, introduction of ready reserve forces, rationalization of education and training, and modernization of the system for defence research and development. Since then he expands the experience to wider security sector issues and implements the acquired knowledge in international projects and support to other nations. Author of numerous scholarly publications on variety of issues related to national and international security, Ukraine’s position and potentials in regional security architecture, democratic civilian control over the military, security sector reform, professional development for civil servants in security sector, fighting corruption, defence industry, peacekeeping, etc. Till 1999 Mr. Polyakov had a distinguished career in the Ukrainian Armed Forces that included service in the General Staff and the staff of the National Security and Defence Council. Upon leaving active military duty the rank of Colonel in December 1999, he became director for security and defence programmes of the Ukrainian Centre for Economic and Political Studies, widely known as Razumkov Centre. In that position he was leading non-governmental efforts to strengthen the public debate on defence and security, including major studies and assessment of defence policy and civilian democratic control, Armed Forces’ professionalization, export controls, and civilian democratic control of law enforcement. 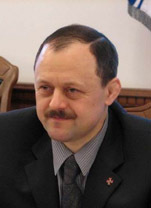 After the Orange Revolution, Mr. Polyakov became Vice Minister of Defence and served in that position for three years. His efforts were focused on modernising and civilianising defence policy making and management, including defence planning, resource and personnel management. He led the development of a unique programme with NATO to provide dedicated professional development for civilian MOD personnel and established a joint management mechanism to coordinate working activities with Allied advisors. Under his leadership the Ukrainian government and society increased the support for UN, EU and NATO operations. He also managed the gradual, coordinated withdrawal of the Ukrainian brigade from Iraq while increasing the support for training of local security personnel.